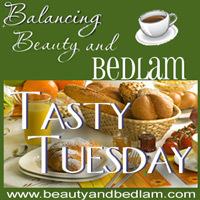 One of the things I love about Tasty Tuesday is the wide range of recipes that are shared weekly. There is something for everyone, no matter what approach you take to cooking. For me, I lean towards homemade, whole foods as much as possible, but at any given time I have processed foods sharing those same shelves. Earlier, I’ve shared my evolution to real food, organic, junk food and in between, looked at examining the Dirty Dozen Organic Food chart when purchasing produce, and then pondered what steps to take about the Food Rainbow/food dye issue and the rising statistics that alarm us all. Many who lean towards organic and whole foods share with me that they don’t coupon because all the coupons are for processes foods. Even though there is a tiny element of truth to that, I really do disagree and find that more and more manufacturers and brands are getting behind the organic coupon movement. Today I am sharing a prime example of that, and was SO excited when this popped up on my screen. 50% off your order at Whole Foods is being offered through Living Social, a daily deal site, similar to Groupon, both which I love and use frequently. 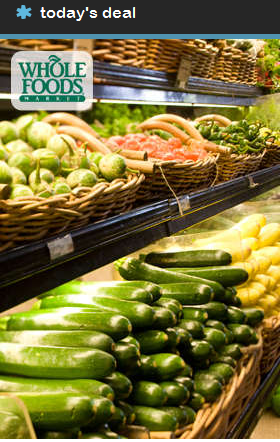 You will get $20 worth of groceries at any Whole Foods when you just pay $10, BUT you must purchase it today. It’s awesome! It doesn’t expire until the end of the year, so you have lots of time to use it, but it will only be available Tuesday. If you have signed up for Living Social before, go right to your great deal. I love easy and odd ways to save on food and this is just one of the best ways to do it – saving cold, hard cash immediately. How you saving money on food lately? Can you share any new ideas that you haven’t tried before with the Tasty Tuesday readers? It saddens me that I can get processed, boxed foods, for A LOT less than a bag of apples or a head of lettuce. However, I have been making a lot of my own “boxed” foods more often, thus in the long run saving me money. I have seen some frugal bloggers who share organic deals on their sites, such as Deal Seeking Mom and Money Saving Mom. Those are somewhat helpful, and I”m seeing more and more coupons slowly coming out for organic, etc. products. I love this link up. I click through every link every week to find inspiration and new recipes. Thank you so much for hosting! Thank, you Michelle. I appreciate more information! Jen, I didn’t put the title of my food on my “link” . Can I change it to “Cinnamon Roll Cookies?” Do I need to relink? Thank you so much for sharing this deal! I bought mine as soon as I saw it on your site. The closest Wholes Foods is 30 minutes from us, however, I try to stop by when I visit my mil who lives near the Whole Foods. I’ll have to go back and read your posts on eating more real food. I was doing pretty well, and then life happened. I’d say overall we do well because of our garden. The hardest part is the meat. I just haven’t found a way to make it happen on a regular basis as a busy mom of 5. I’ll just keep working at it! Thanks for hosting. I’m off to visit the other entrants too. The coffee cup titled ‘Kelly’ is a Vegan Pumpkin Spice Creamer. Hey, Thanks for these amazing and wonderful recipes. I love eating and fond of cooking. I really appreciate your blog and very thankful to u all above for these efforts.